Fly Fishing for Tarpon in the Florida Keys. Fly fishing for tarpon in the Florida Keys is another unique experience. The gin clear waters provide amazing, heart stopping opportunities during the spring migration season. 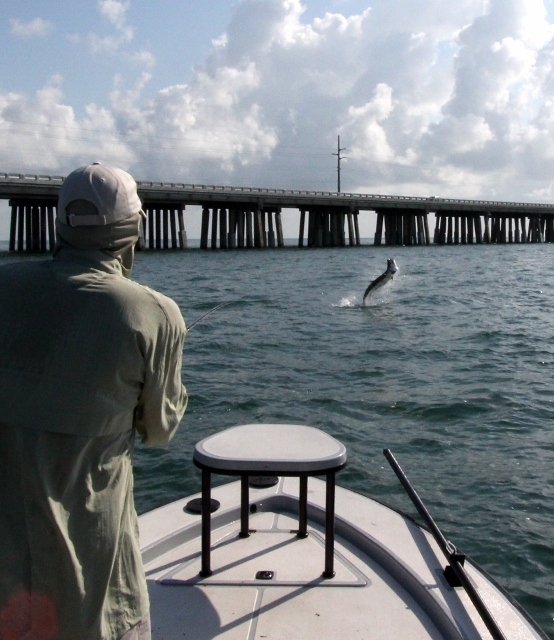 Resident tarpon are at the bridges on the Overseas Highway virtually all year. Go to any bridge, walk out on the Old Seven Mile Bridge which has been converted to a series of fishing bridges, and look down in the shadow line. You will often see them nose into the current. During the migration, the first “push” of fish comes through the lower keys in early Spring when the water warms from the eastern gulf. They lazily work their way through the channels into the oceanside basins and bridges about the same time as the fish move in Everglades National Park. Savvy lower keys guides know this, calling clients to come for the hunt. At times you can also find rolling and laid up fish when weather and tide conditions are right. Then as the season progresses, these fish will pour into the Middle Keys. This is fishing the locals know about and your magazines and TV shows never mention. You probably thought "tarpon season" was just June and July! As the season builds, these fish move in and out until late May and early June when the fish migrate between the bridges and basins. Tarpon tournaments abound during this time - weary guides will be staked out on bumps at the edge of flats, waiting for tarpon schools to cruise by - giving clients the thrill of making that perfect presentation. Places like “confrontation point”, “the stadium”, “the pocket” and “the bowling alley” are legendary and are where anglers like Ted Williams learned the trade. During this full blown tarpon season, knowing the local fly fishing etiquette is critical. Places like "the pocket” have strict rules like “only three boats allowed” and “your boat must be tight to the flat” and no back casting to fish once they go by the boat”. Violators will be reprimanded by locals - pick your poison if you ignore another’s boundary. Know the rules and you'll never have a problem. Long casts and perfect presentations will be required unless the light is low or you find a bunch of feeding fish. The majority of these fish don’t want to eat as they cruise by. You must make them see the fly and tweak their instincts to "make" them eat. This is some seriously challenging fishing with great rewards when it all comes together. Rods: 9wt - 12wt depending on conditions. Leaders: 40lb, 50lb, 60lb, 80lb shock tippet depending on conditions. see my tarpon leader system page by clicking here. Flies: smaller flies as the season progresses, browns in the back country, blacks, orange/green toads in marabou and yellows. Tie sparse they have seen lots of flies. 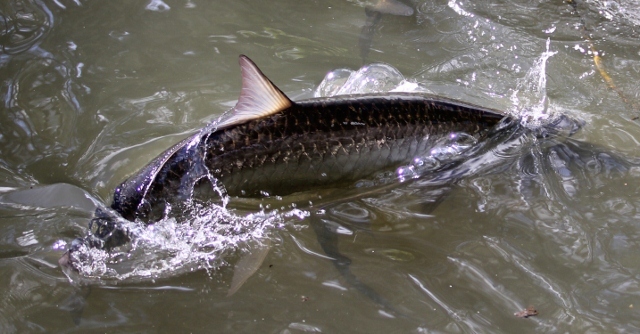 To read about Tarpon on Fly in Everglades National Park, with Miami Fly Fishing Guide Capt. Dave Hunt, click here. To read about Tarpon on Fly in Miami/Biscayne Bay, with Miami Fly Fishing Guide Capt. Dave Hunt, click here.